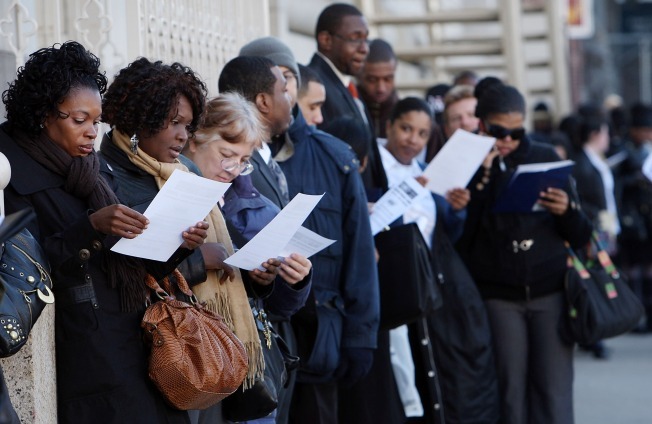 Policy makers have been issuing fairly stern warningss recently about the possibility of a jobless recovery. The notion of a jobless recovery is gaining traction among those who think the economy is finally getting back on its feet—but not enough to move the stock market. "How could we have a recovery if there are no jobs?" wonders Kathy Boyle, president of Chapin Hill Advisors in New York. "Seventy percent of GDP is consumer spending, the US is 25 percent of world GDP. This started with housing, it's going to end with housing, and housing and jobs are related. One's connected to the other." Though in most past recessions simultaneous growth in jobs and the economy was considered a given, the past two decades show examples of a divergence. The 2003 recession recovery saw GDP climb at a mid-year rate of 4.5 percent while payroll growth actually fell about 0.4 percent. A decade earlier off a recession, GDP gained 5.0 percent while payrolls also dropped 0.4 percent. Economists at the time attributed the moves to increased productivity that overshadowed the employment drops. Some experts think the same phenomenon could be happening again. "The economy is definitely on the mend and we are heading to recovery by the latter part of this year," says Peter Cardillo, chief market economist at Avalon Partners in New York. "Jobs generally recover after the economy recovers. That's traditional and I think that will be the case around this time, too." Minneapolis Fed President Gary Stern told PBS in a Tuesday interview that there is a "reasonable possibility" of another jobless recovery. At the same time, the San Francisco Fed put out a dour forecast last week that the employment picture remains perilous and a jobless recovery similar to the 1992 model is "a plausible scenario." Using a detailed analysis that looked at "involuntary part-time workers" and their impact on the standard unemployment rate, the San Francisco Fed concluded "that the labor market has considerably more slack than the official unemployment rate states." "This suggests that, more than in previous recessions, when the economy rebounds, employers will tap into their existing workforces rather than hire new workers," the San Francisco Fed said. "This could substantially slow the recovery of the outflow rate and put upward pressure on future unemployment rates." The increasing prospects of an economic recovery that does not include a corresponding benefit to the employment rolls has some stock investors worried. Art Cashin, director of floor operations at UBS, told CNBC that the concept presents problems for the market. He spoke after the government released weekly jobless claims numbers that at 601,000 were lower than the market expected but still reflective of a high number of continuing claims. "Continuing claims continue to be a problem," Cashin said. "Anything over 600,000 is not pleasant for this economy, and it continues to look like if we get a recovery it will be a relatively jobless recovery and that'll be something we struggle with." Indeed, Boyle sees a market that is determined to go higher but likely to hit a wall once valuations reach a level not supported by an economy still struggling to put people to work. "We think there's still going to be another shoe to drop," she says. "We're going to have an upward bias for the rest of the month. We're still looking for a 20 to 25 percent selloff in August." The weakness in the job market will combine with surging Treasury yields and their impact on mortgage rates to cause headaches for investors, says Matthew Tuttle, president of Tuttle Wealth Management in Stamford, Conn.
"The jobs are part of it, but I think there's a lot more going on," he says. "What's there to stabilize this economy? What's there to stabilize the banks? The jobs are a concern. I don't see you getting a major recovery when half of everyone you know is unemployed and another quarter is scared to death they're going to be unemployed at some point. Those people just don't go out and spend a lot of money." Yet Tuttle, like many other portfolio managers, is not ready to step in front of the market freight train yet. He's long on virtually all areas of stocks, taking out ETFs that track the entire Standard & Poor's 500 (such as the SPDR S&P 500 receipts (AMEX: SPY)) as well as the Russell 2000 small-caps and commodities. The only area where he's short is Treasurys. "I'm not going to fight the market. The market's going to tell me what I should do. Right now the market's telling me it wants to rally," Tuttle says. "We'll be in, but we'll be looking to pull the trigger to get out on strength. When it's rallied enough we're not going to be greedy and try to grab a few extra points here and there."